What Are TNF Alpha Antagonists? Home > Treating Back Pain > What Are TNF Alpha Antagonists? Back pain and joint pain are common features of several autoimmune diseases such as rheumatoid arthritis and ankylosing spondylitis. The latter specifically affects the spine, causing it to curve at an early age, causing intense, almost lifelong spinal pain and serious disability. Autoimmune diseases arise when the body sees a molecule in its own tissues as a foreign invader. It attacks it, as it would a virus or bacterium that was trying to cause an infection. The result is widespread destruction of the tissues carrying that molecule. Until about 5 years ago, the main treatment for autoimmune diseases in which the joints and spine were affected was symptom control. 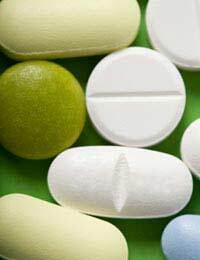 People were given a range of different pain killers to help them cope with the discomfort and steroids were also used for short periods to try to control and curb the inflammation. Many autoimmune diseases go into natural remission, particularly in women who are pregnant, but then often flare up again, coming back with a vengeance. TNF-alpha inhibitors are a new class of drugs that target a molecule in the body called tumour necrosis factor alpha. It is called this because it was first discovered when researchers were looking for factors in the body that kill tumour cells (necrosis is a medical word for killing). It turns out that this molecule plays a very important role in directing the immune response to the body’s own tissues in autoimmune disease. It follows that blocking its action could help reduce the impact of the autoimmune disease – and many clinical trials have shown that this is the case. There are now several different TNF-alpha inhibitors that have been approved for use in the US and in Europe. Adalimumab is a whole monoclonal antibody that fits into TNF alpha receptors in the body, stopping the real TNF-alpha from binding and causing an immune overreaction. Infliximab is another whole monoclonal antibody but there is also an antibody fragment called etanercept that has the same effect but doesn’t have quite as many of the side effects. All three have been used successfully in rheumatoid arthritis, ankylosing spondylitis and psoriatic arthritis. Some people respond better to one rather than the others and some people find that their response to their first TNF-alpha inhibitor decreases after a few months but they can benefit from switching to another. This class of drugs is a highly directed therapy that only targets TNF-alpha. It doesn’t kill cells, or have widespread toxic effects in the body. Like all drugs, it has side effects – and these could be predicted before the drug was used in thousands of people. Since TNF-alpha inhibitors stop TNF-alpha working, this means that the body’s immune response is generally lower than it would normally be. People taking one of the drugs in the long-term can therefore be more prone to infections, because they can’t fight them off as easily, and they can be at a higher risk of some cancers. People under long-term treatment with TNF-alpha inhibitors need to be monitored carefully to see if they show any signs of serious infection, or tumours so that they can be treated quickly. The effect of the drug on their autoimmune condition is often so good and so dramatic that most people are prepared to take this risk.